One of my passions in life is woodworking. I have thought about why that is. I spent many of my earlier years aimlessly wandering. People would say "Get a hobby." Well hobbies are suppose to be fun. Something you enjoy doing. I had no idea what I enjoyed doing. I hadn't taken the time to figure that out. I was busy. School, work, work, school. It would continue like that until I met my wife. So busy doing something but, really I wasn't doing anything. I got into woodworking by necessity. We had become first time home owners and a few things needed to be done. I wasn't about to pay someone to do it for me. Yeah, you can call me cheap but that really wasn't what it was about. It was my home, my castle. It was my domain and I wasn't about to have somebody do what I viewed as my responsibility. I had a wife and a child to care for and it was high time I shouldered some responsibility. It was an instinct. Perhaps some dormant genetic code that awoke. I now call this the caveman instinct. Women have it too, they just express it differently. The psychology of it is not hard to understand. My family has a need. I take on the project and meet that need. I have now provided for my family and improved my skill set which helps meet the families next need. It is a euphoric experience. One that provides the drive to keep pushing myself and improving. So, I suppose it is not surprising that other passions would arise out of that same caveman instinct. Gardening, I have found is a great way to meet the families needs on the most basic of levels. It is no secret that our food supply in America has become tainted. Between genetically modified foods and the overuse of pesticides it is no wonder Americans are among the sickest in the world. Of course that is only the tip of the iceberg and whether you agree with me or not you would be hard pressed to find someone that would say growing your own food is not a good thing. Like many people our space for growing food is limited. So recently I have started to look for ways to get more production out of the limited space that we do have. 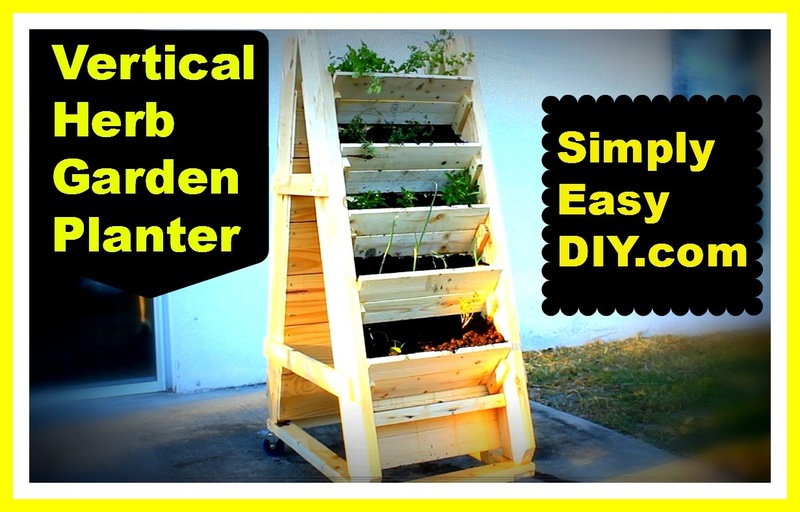 I figure a vertical herb garden might be a good way to do that. I went with dimensional lumber from my stack of scrap wood. "Here he goes again with the scrap wood!" you say. Well, it is a great way to get more bang for your project buck. In fact the word has gotten out in my neighborhood. If someone is throwing something out that is made of wood, I usually get a visit asking if I would like it. I can't remember a time I said no. If you are not doing the same thing you are letting some valuable resources go to waste. In fact you wouldn't even need to use wood for a project like this. I have seen them made out of PVC or even old gutter material. 4 - 2x6's @ 52"
20 - 1x2"s @ 5"
2 - 1x4's @ 19"
2 - 1x4's @ 32"
20 - 1x4's @ 18"
The angle of the cleats can be whatever you want them to be. The way I figured mine was to measure about 9.5" down from the short angled cut that was to be the top of the legs. Then space the rest of the marks 8" apart thereafter. Then from the long angled cut side I measured 11" from what would be the top of the leg and then every 8" thereafter. This gave me an offset of 1.5" for the cleats. You can view the video at 1:30 to see how I lined up the corners of the cleats to the marks. In the video I state the marks are spaced 9.5" apart. That is how I originally marked them but decided that was too far apart so I changed it to 8". I did not realize my verbal mistake until it was too late. However, it is worth noting that 9.5" does indeed work. I just deemed it more visually appealing at 8". If you have any questions please don't hesitate to ask. Don't forget to visit my Youtube channel. You can like and subscribe if you have not already. Also, you can find me on facebook and pinterest as well. thanks for the post, going to use this similar design for a stationary version against my fence line.